Every year cell towers do collapse; sometimes with catastrophic consequences beyond the simple CAPEX of a cell site. The inclination sensor monitors the stability of the structure. It digitally monitors the banking angle. It will trigger an alert as soon as the tower is no longer level and has crossed a maximum banking angle tolerance. The quality of power is one of the main reasons causing equipment to fail, data to be lost or shortening life span of electronics. All impacting business operations. This sensor is able to detect up to 85% of all power quality issues. Plug & Play. No electrical work needed. Temperature & Humidity sensors monitor that your network equipment is running within manufacturers' limits in order to maximize uptime and avoid early failure due to equipment stress. Overheating equipment can also be detected in closed enclosures. To monitor the security of your cell site, we do offer multiple sensors to protect your infrastructure site. The sensors are meant as a backup to primary building monitor systems. Copper theft is a key issue faced by mobile operators around the world. Removed copper ground pins may result in the total loss of a cell site if not detected on time. In hot & wet environments, copper grounding is also subject to corrosion which may affect your equipment. The Ground sensor monitors continously up to 7 grounding circuits to ensure proper function. Whenever your copper ground is disconnected, stolen or corroded then you will be alerted through the ground sensor. The DC power meter monitors the voltage of your batteries and can measure the current drawn from them. The Hydrogen sensor will monitor the Lower Explosive Limit (LEL) for compliancy with ATEX directives. The ACID leak sensor will detect leaking batteries. Regular temperature sensors give you the temperature of the air touching the sensor. The thermal camera sensor monitors the temperature of the equipment it sees. It checks it in 4800 points within its 50°ree; Field Of View. The camera sensors can replace rack level temperature sensors while providing a higher accuracy compared to regular temperature sensors. Using the Dry Contact sensor you can IP enable any of your existing output alarms and integrate them via SNMP with the NOC. The IO sensor has 16 inputs and 4 outputs. The water leak snake cable is put under the raised floor. It triggers an alert as soon as any part of the cable comes into touch with water. We recommend to put the sensor around the perimeter of the wall and under each air conditioning unit. Through the generators dry contact outputs you can monitor its operation state using the SensorHub. With the Shock & Vibration sensor mounted onto the generator enables you to monitor abnormal behavior of the generator. The thermal camera sensor can detect thermal runaways of the generator (overheating). 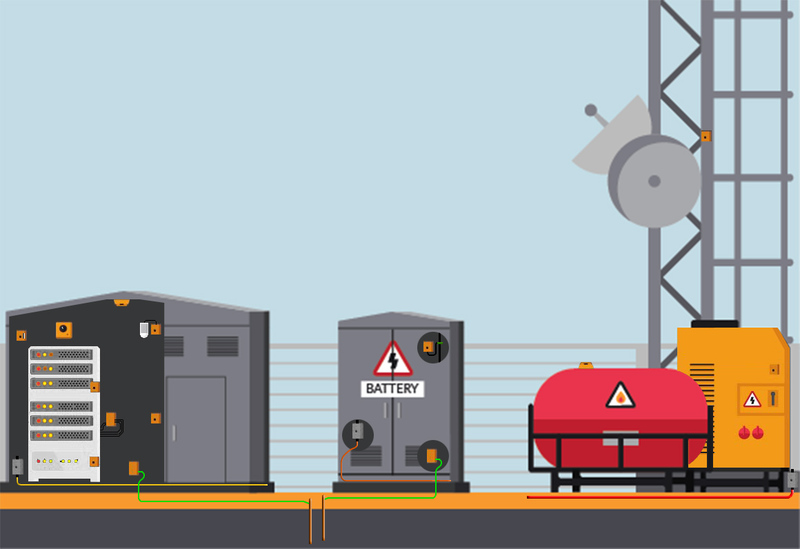 Fuel is for most operators the number one cost of their cell sites. A fuel level sensor will inform operators when a critical level has been reached requiring refueling of the tank. However its primary use is fighting delivery fraud; a growing problem with soaring fuel prices. That's where this fuel level sensor comes into play. ServersCheck's special projects team can create custom sensors matching your requirements. We also can combine multiple sensors into one device. An example of such a customisation is our Multi-Sensor & Hub. Following ServersCheck sensors are recommended for monitoring cell sites & telecom infrastructure. They all connect to the base unit and their data is accessible via Modbus TCP, SNMP, XML or JSON. Base units are powered via 12v DC or -48v with the optional ADDON-POWER. Ambient room monitoring with the temperature & humidity sensors. Cell sites depend on their connectivity with the back bone. Using its built-in PING checks, the base unit can perform a power cycle of the router in order to attempt to restore the network connectivity. Inclination sensors will monitor the structural integrity of the cell tower by monitoring its banking angle. Power is what keeps the lights on in your cell sites. The power failure sensor will detect when utility power goes down and will alert you. Using the dry contact outputs from the Sensorhub it can trigger an alternative power source. The thermal camera sensors measure the temperature of your electrical equipment or generator. They replace the manual thermal gun inspections by doing it non stop. Thermal runaways of generators may result in a failure that would go undetected with regular temperature sensors. Within their 50°FOV they monitor temperature in 4800 points; every 2 seconds. The fuel level sensors monitors the amount of fuel left in your generator tanks. Battery leak detection sensors will trigger from your acid battery leaking. Cell sites are unmanned. When something goes wrong one can detect it through an abnormal sound. Our sound sensors are your ears in your facility. Copper theft is one of the key challenges that operators face. Knowing when the grounding has been compromised is what avoids downtime or permanent CAPEX less. That's where the grounding sensor comes to play: safeguard your infrastructure by monitoring the electrical grounding; non-stop. The IO Dry contact sensor enables you to transfer analog alerts via SNMP to your NOC. Physical Security is monitored through the Multi-Sensor & Hub with its built-in security sensors for detecting luminosity levels (light in LUX), CO, motion, sound and shock / vibrations.